- Sean Linehan - President - Linehan Communications Inc. 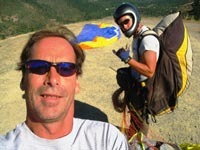 Learn to Paraglide in Albuquerque with Enchanted Air Paragliding. You may contact us by postal mail, telephone, email, or by filling out the contact form below. Young, not-so-young, male, female - paragliding is a sport that can be enjoyed by a broad cross section of flying enthusiasts. Ease of learning to fly a paraglider, as well as the portability of equipment enable convenient transporting and flight as well as hike to fly options no other form of aircraft provide.